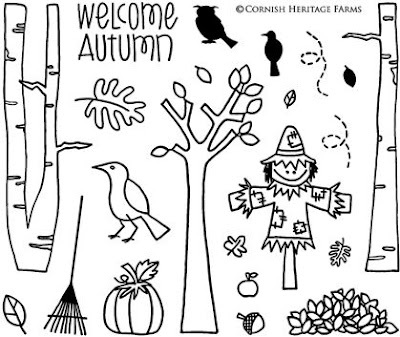 Welcome Autumn Card - For my first project, I couldn't resist creating a happy, Fall scene on the front of my card. Again, I used Timber Brown Staz On ink to stamp my images. I painted the leaves using Sunflower and Fire Engine Red Shimmerz, and Spiced Cider Blingz. The crow is filled in with Coffee Shimmerz. A big THANK YOU to Cornish Heritage Farms for swapping with us! I can't wait to see what the other team members have in store for us this week! 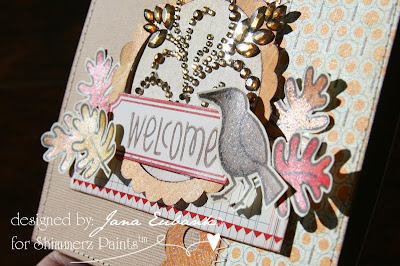 You worked those stamps, Jana! Great job! Oh how darling! I love both projects!